200,000 years from now the universe is divided into stellar kingdoms. John Gordon is torn from his 20th Century humdrum into otherworldly intrigue as he exchanges bodies with Prince Zarth Arn, heir to the Kingdom of Fomalhaut. Shorr Kan, Lord of the Dark Worlds, schemes to kill Zarth Arn and overthrow the alliance of the Star Kings. Gordon reluctantly assumes the role of Zarth Arn to prevent Shorr Kan from throwing the entire universe into interstellar anarchy! Forged in the hellish heat of Mercury and tempered on the desert sands of Mars, Eric John Stark battles the forces of evil and tyranny, selling his sword-arm to defend the cause of justice among worlds of sin and decay. 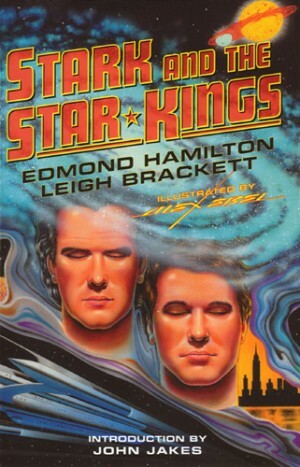 In their only formal collaboration, Hamilton’s Star Kings and Brackett’s Eric John Stark meet to confront a peril of unending doom. Can Stark persuade the Star Kings to put aside their political games long enough to defeat this threat to the whole universe? For the first time, admirers of both authors can enjoy this long-coming story. "(on The Star Kings) "Fantasy fans won't regret the price of admission." ". . . heady, action-packed tales that should never have gone out of print. The star-spinning allure of Hamilton, the against-all-odds underdog triumphs of Brackett both are utterly bewitching, the roots of such later phenomena as Star Wars." " A 'must-have' omnibus collection especially recommended for golden age science fiction fans." "There's only one Leigh Brackett, and there's only one Eric John Stark, both stand along in their field!" "Hamilton and Brackett's type of 1940s/1950s space adventures blazed the trail for Star Trek, Star Wars, and numerous books and films that define the genre for legions of fans. A tad pricey, but beautifully done; a labor of love for the publisher. Classic sf fans will be hot for this one. "Stark and the Star Kings is a truly gorgeous book . . . I knew the three Leigh Brackett novellas previously, but it is wonderful to have them in so permanent and esthetically satisfying a form. The Star Kings I had never read, and I must say that I enjoyed it thoroughly." "Haffner has turned out some very useful retrospective collections in the past few years, to which list this new title is a very welcome addition. Hamilton and Brackett were married but, insofar as I had known, never collaborated on any of their fiction. It appears that they did so in at least one case, a crossover story which I believe appears here for the very first time. Hamilton wrote primarily space opera on a grand scale, and the Star Kings series is perhaps his best known, although personally I think it inferior to many of his other novels. Leigh Brackett produced a variety of excellent stories and novels, but is perhaps best remembered for Eric John Stark and his adventures in the now improbable towns on a wild western colonial Mars. Brackett wrote two series of Stark novels, of which this is the earlier, three short novels two of which appeared from Ace books under different titles and now appear here as they were known in the magazines. Some nice interior illustrations and an introduction by John Jakes complete this very attractive and very welcome package." "A very handsome book. I love the jacket and the illustrations. Leigh and Ed would be proud!" ". . . an extremly handsome oversized collection . . . You've got two novels here by Hamilton, three long stories from Brackett and one collaboration. You've got a beautifully made book and knockout covers. If you have any fondness for the old pulp days, this is the collection for you." ". . . good old-fashioned outer-space slam-bang action. A lot of fun . . . (a) major collectible . . . a very beautifully, lovingly produced book . . . lavishly illustrated volume . . . you'd think it was 1943 and you were picking up Startling Stories . . . if that's your kind of thing—you will love this book." ". . . there's enough high-quality reprinted material in Stark and the Star Kings to make it a desireable purchase."